When it comes to shoulder-friendly upper body exercises, there is none better than the dumbbell floor press. It is a pressing exercise similar to bench press, but it utilizes the floor rather than the bench. It helps in working the triceps harder than ever, removing the strain placed on your shoulder joints. Doing floor press with dumbbells helps restrict the range of motion, and lets you give more attention to your arms than the chest. 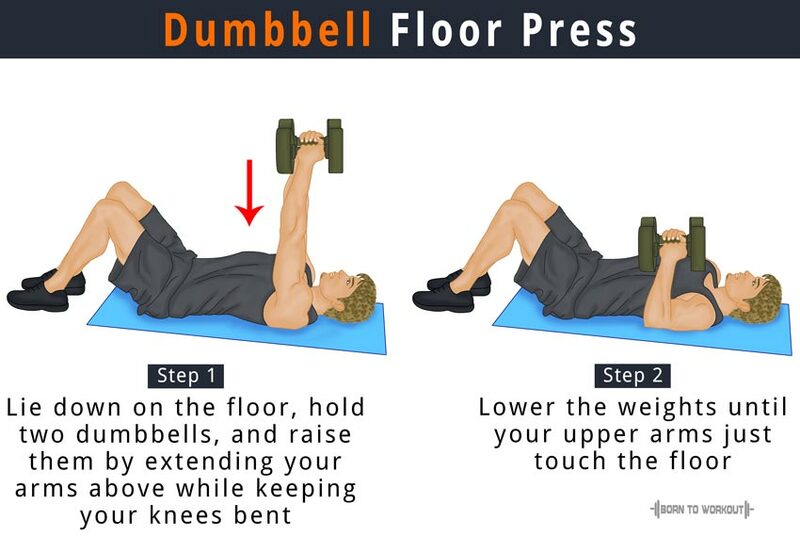 Moreover, you can perform dumbbell floor presses by using heavier weights than those used in simple triceps isolation exercises like triceps pressdowns and extensions. Lie down on the floor and hold two dumbbells on either side of your body. Keep your knees bent, and raise the weights by extending your arms until your elbows are locked out. This is your starting position. Lower the weights until your upper arms just touch the floor. At the bottom, pause for a moment and then push the weights up by extending your elbows. Lie flat on the floor, holding one dumbbell using an overhand grip. Keep your knees bent with your feet firmly planted on the ground. Extend your free arm and keep it flat on the floor. 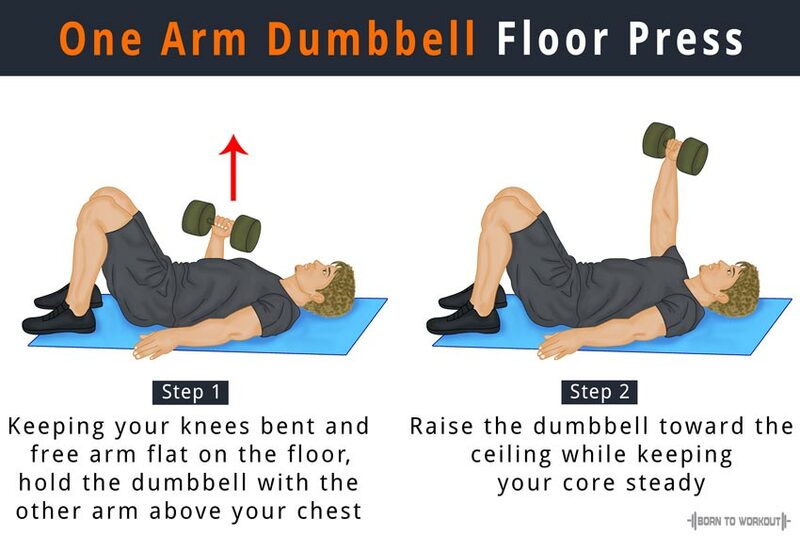 The other arm holding the dumbbell should be extended outward, with the elbow perpendicular, the triceps resting on the floor, and the weight held above the chest. This is the initial position. Exhale and keep your core steady while pushing the dumbbell toward the ceiling. Pause temporarily at the bottom of your movement, and then return to the starting position. Continue the above steps with the other arm. While lowering the dumbbells, make sure that your upper arms do not rest on the ground. Tuck your elbows to enhance size and strength of your triceps, or keep your arms in an angular position to the sides in order to strengthen your chest.